A personal injury case is not something you just hand to a lawyer and then wait for him to hand you a check a few months or years later. Your lawyer needs your help! Understanding the process empowers you. The "knowing" client often gets better results. That's why Michaels & Smolak's Mike Bersani wrote this book: To help his clients, and all New York personal injury claimants, bring their cases to a successful conclusion. Get informed now! 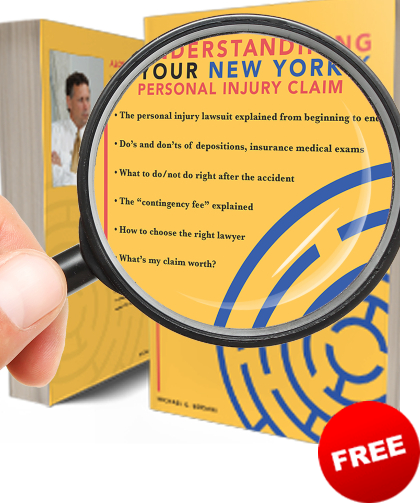 Use the book as a handy reference source for guiding you through your own personal injury case from beginning to end. Learn the "do's and don'ts" of depositions and insurance required medical exams. Understand how the contingency fee really works. Learn how lawyers decide what your case is worth. And learn much, much more. This book is an indispensable companion for your New York personal injury case. Simply fill out the form below to receive your free book. (We will not call or contact you, but you will start receiving our free quarterly "newsletter". You can "unsubscribe" to it at anytime).